This program was written for the members of the Jorgenson Group to help them keep track of scoring and game statistics when playing the games of Cricket, 301, and Golf. It supports up to 6 teams of two players each, includes modes for both cut-throat and polite scoring, and ranks players based on a unique algorithm that takes player strengths and recent games played into account. 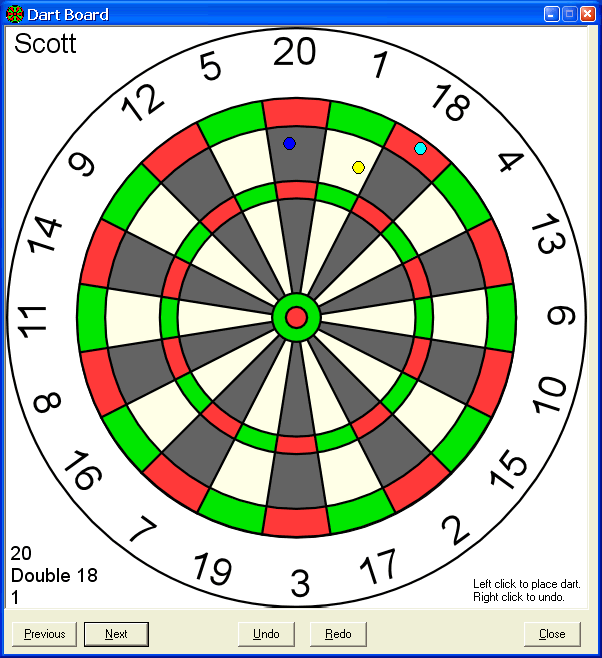 The software includes a graphical representation of the dart board plus the ability to play sounds for each player and important events (customizable). See below for the installation file. 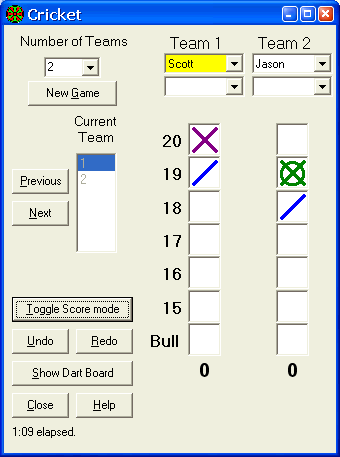 At SourceForge, click "Download Dart Scorekeeper" then download file DartScorekeeper_v3.02.1_setup.zip. Microsoft: If running Windows 95/98, download this file. If running Windows NT, download this file. Simply download the DartScorekeeper_v3.02.1_setup.zip file to a temporary directory, unzip it, and double click DartScorekeeper.msi file. If installing over a previous version of the program, be sure to make a backup copy of the Stats.ini file before installing. A collection of sound files for various dart events is also available for download (1.0 MB).